Ron Kharbanda has done business with plenty of restaurants and cafés, but when the time came to buy a business of his own, there was only one choice for him – Burger Wisconsin. 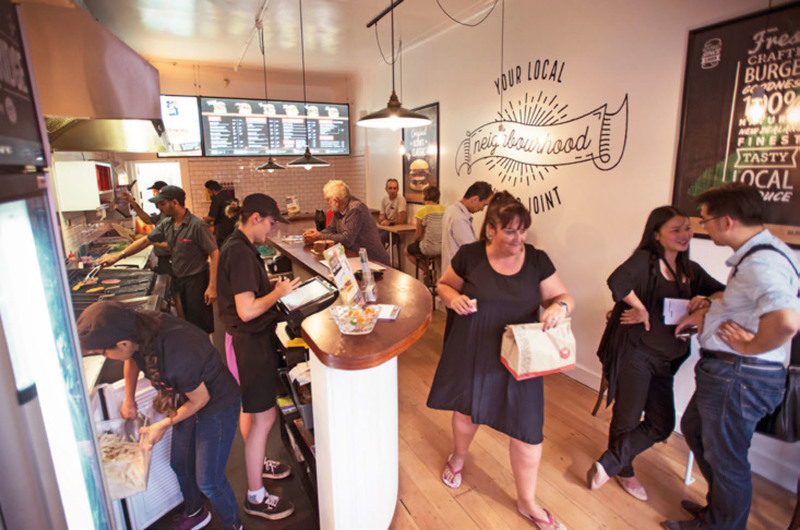 The original gourmet burger brand has been a quiet achiever in the New Zealand hospitality scene since 1989 with 22 franchised outlets around the country, but it’s recently been revitalised following its purchase by Mariposa Restaurant Holdings, the group behind Mexicali Fresh. It was this new ownership – and the people behind it – that attracted Ron’s eye. In his late twenties, Ron has an impressive CV. He self-funded, launched and eventually sold a business putting advertising screens into restaurants, cafés and retail spaces before taking on a position as national sales manager with the Karajoz Coffee Company, one of Auckland’s longest-established coffee roasters. ‘I was in contact with so many cafés, restaurants and bars through these roles that I gained a real insight into the hospitality industry,’ says Ron. ‘Owners would talk to me about experiences good and bad, changing tastes and even about the people in the sector. Obviously the trend to fresh food and healthy eating was one of the things that came up often, along with the growth of fast casual dining – all areas in which Mexicali Fresh excels. When I was told Mariposa had bought Burger Wisconsin and Nathan Bonney (who had helped grow Columbus Coffee into a market leader) had joined them as general manager, I reckoned they must all see a big future in the gourmet burger market. What Ron found was a company which now had the investment and expertise to capitalise on its reputation. Burger Wisconsin was using 100 percent pure beef, lamb, fish and chicken combined with fresh, local ingredients long before it was fashionable, but the outlets themselves were looking a little tired. That’s something you could never say of Mexicali Fresh, and the new owners promptly set about a refreshment programme. Nathan Bonney says that one of the keys to success in refreshing the Burger Wisconsin brand has been not to mess about with the products themselves. ‘They are wonderful and have a massive following, which you can understand when you taste them,’ he says. ‘But what we can bring to the franchise is a fresh look, better systems, better support and more buying power. Add all those together and you make a big difference to franchisee profitability. ‘Ron’s Remuera restaurant and Brooklyn in Wellington are the first with the new look. Others are currently being refurbished while at the same time we are fitting out and opening new Burger Wisconsin sites in Auckland and around the country. What that means is real opportunities for people like Ron: people who don’t necessarily have a food service background but who have a business head, a genuine passion for Burger Wisconsin and the energy and ambition to succeed. Ron adds, ‘Nathan’s not wrong about support, and it doesn’t just come from the franchise team, either. As franchisees, we even have our own private intranet which is a well-utilised and engaging forum where you can discuss opportunities and ideas, share experiences and ask for help when you need it. It’s actually fun!